Rwandan troops have been accused of carrying out raids inside the Democratic Republic of Congo and attacking and burning villages. From the eastern town of Beni, Congolese regional cooperation minister Mbusa Nyamwisi said: "We are being attacked by the Rwandan troops." United Nations peacekeepers say they cannot confirm the allegations. The UN humanitarian agency (OCHA) says thousands of people are reported to be fleeing their homes. Earlier, President Paul Kagame said in a speech that Rwandan troops may already have crossed into DR Congo in pursuit of ethnic Hutu rebels. He told senators attempts to disarm forces across the border "will not take long, or it is even happening now". Rwandan troops were reported in the DR Congo on Monday by diplomats, but UN forces on patrol have not sighted any. The Congolese authorities say they will send more than 6,000 troops to the border area within the next two weeks. Rwanda has consistently warned that it is prepared to take military action because of the threat it says is posed by the group which include fighters who took part in the 1994 genocide of Tutsis and moderate Hutus. Some Congolese analysts say that the real reason behind Rwanda's threats is that President Joseph Kabila has recalled the governor of North Kivu province, based in Goma, who is from the Rwandan-backed RCD former rebel group. They say Rwanda wants to ensure it retains control of the border area. Residents of the Congolese border town of Bukavu have reportedly been gathering stones to use to fight off any Rwandan incursion. The rebel Democratic Forces for the Liberation of Rwanda (FDLR) says that a brigade of Rwandan soldiers has crossed the border into North Kivu province, reports the AFP news agency. The United Nations last week warned Rwanda not to use military force, saying such a move could undermine international efforts to stabilise the region. Rwanda has twice invaded its much larger neighbour - in 1996 and 1998 - accusing the different Congolese governments of backing the Hutu rebels. It withdrew its troops in 2002, under a regional deal to end five years of war in DR Congo, in which some three million people died. Under that deal, the Hutu rebels were supposed to have been disarmed but progress has been slow. 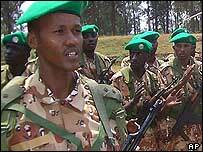 Rwanda says that the rebels are now attacking its territory under the noses of the international community. Last week, the first of 5,000 extra UN peacekeepers arrived in DR Congo. There are already more than 10,000 UN peacekeepers in DR Congo and troops have been placed on alert and patrols have been despatched to check for any Rwandan incursion. However, they say they have no knowledge of Rwandan forces having crossed the border. A spokesperson for the UN peacekeeping mission told the BBC's Network Africa that their patrols by air and on the ground have not encountered any Rwandan presence in DR Congo since the threats were made.